At Theppakadu, turn left across the Steel Bridge and travel towards Masinagudi – 7kms. Cross Masinagudi town and proceed on the Ooty road and take the second turn to the right (a post indicating names of resorts is on the left hand side) and you will reach a village by the name of Dodulingi – 3kms. 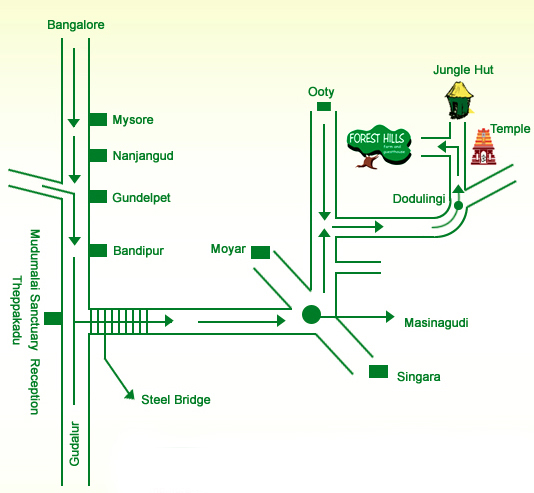 Keep left and proceed till you reach the entrance gate of Jungle Hut – 1.5km. Take a left turn and the road will lead you to Forest Hills – 0.5kms.